Clog that combines technical properties and therapeutic to offer you a professional footwear comfortable, beautiful and practical. Adjustable. Your strap folding with two positions ensures a perfect fit. Breathable. Their side perforations evacuate the excess of heat and moisture, keeping the foot cool and dry throughout the year. Anti-static. Your special piece inserts in the outsole will help you eliminate the accumulated electrical charges by contact with electronic devices or by the friction surfaces conductive. Washable and sterilizable. You can wash your Clog in the washing machine, even sterilize them in an autoclave. 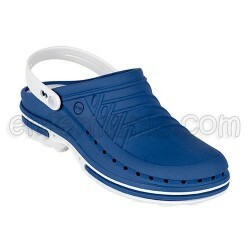 The material used in the manufacture of these clogs is designed to not deform with the high temperatures. Antishock. Their special templates have a system for attenuating the impacts that absorbs impact on the joints. COMPLIES WITH EUROPEAN REGULATIONS IN THE FIELD OF PROFESSIONAL FOOTWEAR.